It's time for another wonderful color challenge at the CR84FN Blog! Thanks so much to those who played along with our last challenge! 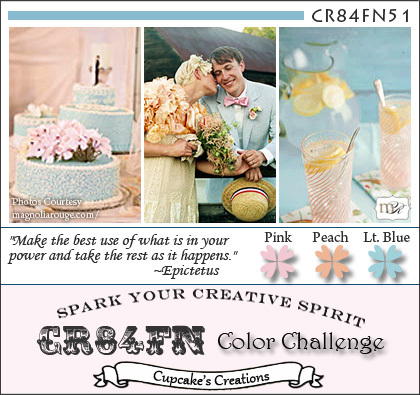 Our next Two Week Color Challenge is to use the colors Pink, Peach and Light Blue, with this challenge we're also excited to welcome two new designers, Shannon White and Pauline Pollington to the CR84FN Team! The quote is from Verses Rubber Stamps, I inked True Friends in Pink Marker and the rest of the quote in Brown Sugar ink and stamped on Vanilla card stock. The pattern papers are from Prima, matted on a Chocolate panel, then Blush base card. To embellish I added a Double Bow using Brown Wrinkled Ribbon and Becca's Peg Bow Maker, and a few embossed butterflies and a Maya Road Trinket Pin. Here's this weeks color inspiration, we'd love for you to play along with us at CR84FN, you can find all the details here on how to enter. If you upload to any online gallery please use keyword CR84FN51 so we can find your creations! Simply beautiful Lisa! Love the quote and the sweet little butterfly embellishments! A beautiful card, the papers are so pretty, and the big bow is gorgeous! Thanks for the warm welcome, I'm so pleased to be here! That verse is lovely and so true. I really like the papers, fabulous bow and sweet butterfly accents! Very pretty and luvin' the big double bow. So pretty and elegant and perfect for a good friend! Lovely! What a beautiful card. Love how you popped the sentiment with the touch of pink in the center. So beautiful Lisa!!! Love the soft DP and the gorgeous ribbon! This week is a very pretty color combo that I wouldn't think of! Your card is so pretty and I love how the black bow just sets it all off! Adorable!! Love these colors!!! Butterflies make me smile!!! PRETTY card Lisa! LOVE the font on that beautiful quote! The papers are FAB, too! Beautiful verse and card Lisa!